Features tributes to John Steinbeck and writing by Jeanette Winterson, Alice Munro, Tim O’Brien, Agha Shahid Ali, Milan Kundera, Lorrie Moore, and Charles Simic. 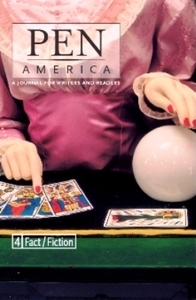 PEN members explore unreliable narrators in politics and literature. W. G. Sebald, Strange to Say . . .
Lewis Carroll, Who’s Dreaming Whom? Alice Munro, What Is Real? Charles Simic sees the worlds.